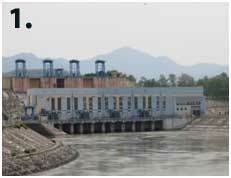 The hydroelectric potential of the Ganga basin has been assessed as 10,715 MW at 60% load factor. Out of the 142 identified schemes in the basin, 22 schemes with a total installed capacity of 2,437 MW are in operation and 12 schemes with an installed capacity of about 2,716 MW are in various stages of construction. 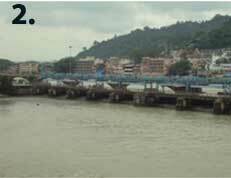 Construction of barrage has greatly diminished the flow of the river and has led to the decay of the Ganga as an inland waterway. 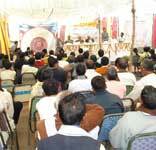 Construction of dam for water storage is quite debatable issue. While dams provide water for irrigation and hydroelectric power is generated but it renders thousands of displace persons, the compensation they get is merger and the harm it does to the ecosystem is tremendous. 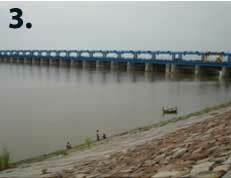 3.Narora Barrage completed in 1878. Tehri is 5th tallest dam in the world. The dam's projected capabilities include an power generation capacity of 2400 MW, stabilise irrigation to an area of 6,000 km² and add another area of 2,700 km², and a supply of 270 million gallons of drinking water to industrialized cities in Delhi,Uttar Pradesh and Uttaranchal. The dam project was approved in 1972 and construction was started in 1978. 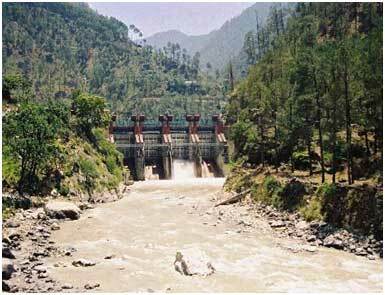 The main dam of the project is built near the old Tehri town that lies at the confluence of the rivers Bhagirathi, (one of the major tributary of the river Ganga) and Bhilangana. 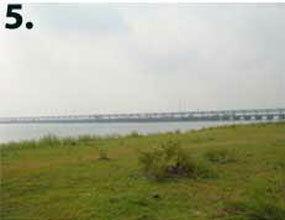 The main reservoir comprises of an area of 42 km². This will sink the old Tehri town and 112 villages around the town, thereby displacing more than 100,000 people. 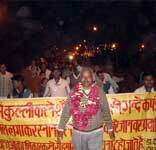 Tehri dam is curse for river Ganga. 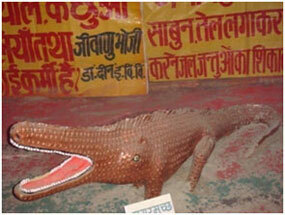 It captured the soul of Ganga ‘Bhagirathi’. Construction of dam has greatly diminished the flow of the river and has led to the decay of the Ganga as inland waterways. Tehri dam is the main dam of the Tehri. Dam was under designed by using low seismicity for Tehri region. Since the dam is located in between the two crashing tectonic plates of India and Tibet known for devastating earthquakes, the risks involved like dam failure result in wiping out of existence several millions of people. Sewage is an excellent medium for the growth of pathogenic bacteria, viruses and protozoa. Domestic sewage and other wastes are thrown untreated or partially treated into the water bodies, such as ponds, lakes, streams and rivers. Since the dumping is uncontrolled, especially near big cities, the water bodies are not able to recycle them and their self regulating capability is lost. This may lead to a number of serious problems. Domestic waste has been estimated about 1.4×106 m³d-1 is going into the river.75% of the pollution load was untreated municipal sewage. 88 percent of the municipal sewage was from the 25 class one towns on the main river. The sewer water that falls into the Ganga is the major cause of pollution, because it mixed the unwanted material and pathogenic germs with the water. The rapid industrialization and the growth in the population substantially alter the nature of interaction of man and his environment. Industrialization, no doubt has a positive impact on income levels, employment and production economics, but it has a number of problems. 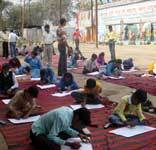 Industries, in India make for a substantial contribution to the pollution load in India. 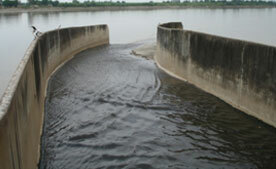 The disposal of waste waters is of widespread national concern. More than 6 million tonnes of chemical fertilizers and 9,000 tonnes of pesticides applied annually within the basin which comes into the river and detoriate its quality. 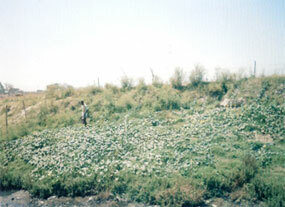 Agricultural development in terms of expansion of agricultural land, increase in agricultural productivity and net agricultural production due to development of modern scientific techniques, advanced technologies, increased production and use of chemical fertilizers, expansion in irrigation facilities, development of high yielding varieties of seed etc. has solved the problem of growing demand of food due to ever-increasing world population on the one hand, it has also created or is creating hazardous environmental problems of serious concern on the other hand. Large scale of deforestation because of encroachment and settlement in the upper reaches, leading to week flows. 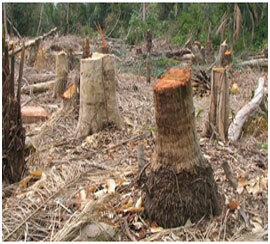 Besides this, various government projects such as construction of dam have harnessed the destruction of forest. However, denuded hill and decimated forest, only promote floods and soil erosion. In such cases, rain water would tend to remain on the surface, resulting in a weak river flow. When a forest is depleted from the upper reaches of a river and sand is removed from the lower reaches, there is no need to have any additional reason for the death of a river. Hardly 14.3 percent of the total basin is under forest cover. Extensive deforestation promotes soil erosion, land slide which decrease the water holding capacity of river. 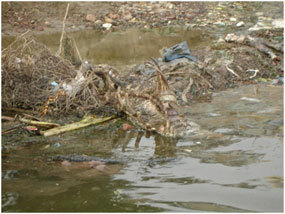 Disposal of dead bodies directly in the river stream is one of the major sources of pollution. 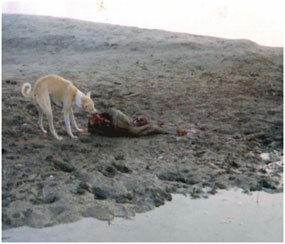 The carcasses of dead animals and half-burn human bodies are also d isposed off in this river. These sources of pollution increased the contamination of organic compounds. When organic compounds enter into water streams, they undergo degradation and purification by bacteria activity .They consumes dissolved oxygen which is an essential requirement for aquatic plants and animals like in water. These pollutants present an anesthetic scene and disturb recreational uses of water. A survey report conducted by Allahabad University shows that in Allahabad at different sites viz, Sringberpur, Phaphamau and about Sangam the no. of dead bodies per 2 km are 11, 14, and 12 respectively. Dhobi whose base of earning is washing of clothes. 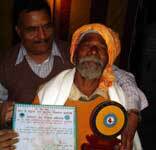 For his work he choose bank of river Ganga because Ganga is the mother of all. 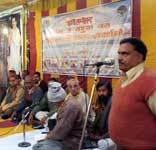 He use various types of material f or cleaning of clothes like detergents, powders, reh etc.all are accumulatated in Ganga water. Detergents are composed of complex phosphates; they increase the concentration of phosphate in water posing eutrophication problems. 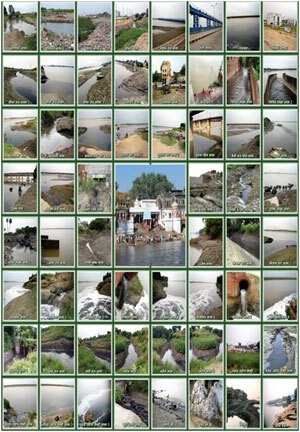 A report shows that along the bank of river Ganga per 4 km have one dhobi ghats. There are 40% to 60% phosphate comes into the river by detergents used by thousands of washermen. 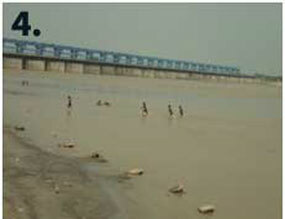 The Ganga basin is the home of nearly 37 per cent of the total population of the country. About 84 per cent of the people live in rural areas, whereas 16 per cent, as much as 40 millions are distributed over 692 towns and cities of the basin. The rural density falls off as one goes upstream, with Uttar Pradesh 286 persons, and Himachal Pradesh 69 persons to a sq km. 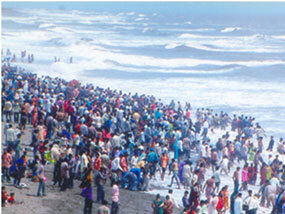 The growth rate of population in the Gangetic basin is very high. 2031 - 1 billion at an average density of over 900 km-², 2.5 billion liters of sewage, or double today's quantity, discharged into the river each day by the year 2020 and close to 4 billion by the year 2030. Solid waste varies in composition with the socio-economic status of the generation community. The following material could be classified as solid waste: The disposal of solid waste poses many problems. This tends to contaminate not only ground water but also surface water, since the two system are ultimately interconnected. Because of the highly organic nature of this material, a large BOD is placed on the receiving water, and the sediments become coated with highly organic zone. 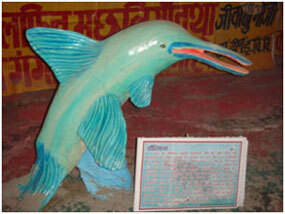 Ganga has very rich floral and faunal life. Today it present an alarming picture because there has bee n a substantial fall in diversity of species and some of the species are on the brink of extinction. 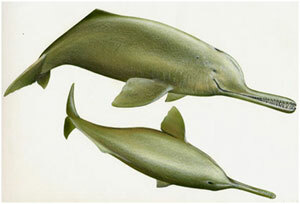 The most significant example is that of Gangas dolphin (Platanista Gangetica) which is now confined to few selected zones only. 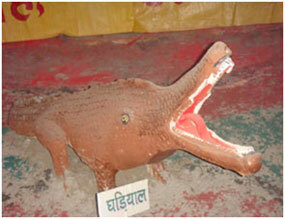 Similar is the story of Gharial (Gavilis Gangeticus) which had a dense population in Kosi till two decades back. 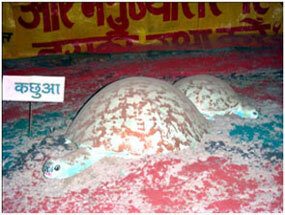 Different of species of turtles has met same fate. 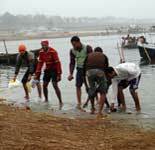 Ganga will remain healthy only if its plant and animal life remains functional and dynamic. Every effort has therefore to be made that the species are properly conserved. A regular monitoring of flora and fauna has to be done a sincere efforts are to be made to ensure protection of the threatened species.